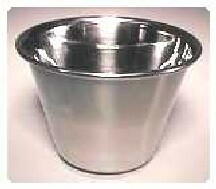 Stainless Steel Cups, tapered for even floating! 2 1/8" at top, 1 1/4" bottom 1 1/2" high Our "Flotives" look great in a crystal bowl of colored or clear water! Recommended wax is the IGI 4794 Votive blend and the 34-40z wick when using as a floater. If using as a standard votive a 44-24-18z will be recommended.